Having recently returned from Colorado, I thought I would share a unique method of rapidly assembling a raised bed. While this method probably works well in Rifle, Colorado where rainfall during the summer is minimal, It would not work in Maryland due to soil moisture causing wood rot. The method used is to embed pallets in the ground, wire them together and line the vertical walls with plastic to conserve soil moisture. They back filled the raised bed with manufactured soil (composted lama manure and soil) and planted the beds. The pipes in the corners are used to water the garden. Interesting design. Another interesting design feature in the same garden was their so called “Keyhole” garden. 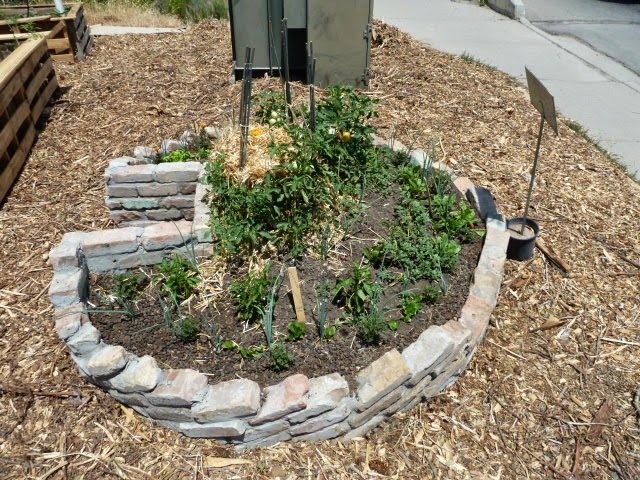 This garden is made using bricks or block, back filled and a small wire cage placed in the center to act as a compost pile (too small and dry to do much composting). This design could be incorporated into a patio landscape and would be great for herbs. As we were leaving, the work crew of 5 and 6 year olds showed up to plant some of the unplanted raised beds. 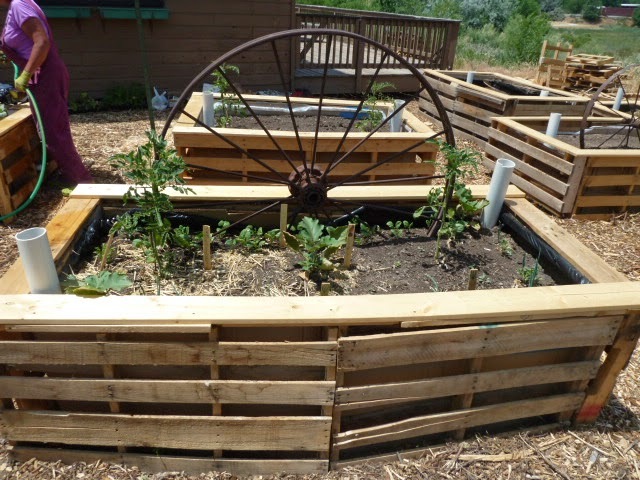 All of the produce from this garden is donated to needy families in the town of Rifle, Co.